Rapid Wall Cover is a waterproof Film makes the prep work faster and easier! Just unroll the plastic from the roll and press the built-in tape down against the surface to be protected. Cut to the desired length and unfold the non-adhesive poly sheeting. It's that easy! Rapid Wall Cover Plastic Film clings to the desired surface once it's unfolded. It will not damage walls, wallpaper, doors, windows, furniture, office equipment, or appliances. The cling feature even "anchors" paint overspray to the plastic film surface, leaving less mess. 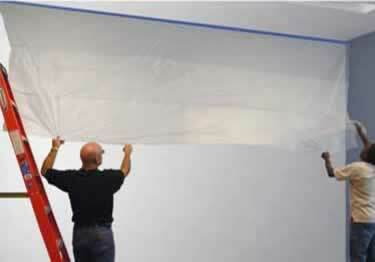 Rapid Wall Cover Plastic Film is great, easy to use, light-duty, cost effective protection! Does the masking tape that comes with it stick to regular painted walls, wood and travertine tiles? Make prep work easier and faster with Rapid Wall Cover. This non-adhesive plastic film comes with masking tape already attached! Available in 2', 4', 10' width rolls. If you are doing interior remodeling, I would highly recommend using this product to protect walls and furniture from dust and construction debris. A great idea to use this poly film WITH blue heavier duty masking tape already attached. I wondered how in the hell I would have installed otherwise. Good, aggressive tape designed for mounting to a vertical surface. A tip for you: If you are using across the middle of a room as I did, and along a wall, then take the time to install a 2 x 2 strip and screw into the studs along the ceiling. This will allow vertical support. Also, have patience when unrolling and affixing along the wall. Suggest two step ladders or step stools AND TWO PEOPLE to help unroll. I used plenty of cuss words along the way. However, recommend. Thank you for your review and kind words concerning the quality of the Rapid Wall Protection Film. We also very much appreciate the detailed feedback concerning the installation process. Hopefully, it will help others down the road.